The entire content of the FS-SCS website is protected by copyright (including scientific terminology). Please quote accordingly, if you use content or terms from these pages. With different photon-based technologies we investigate energy conversion and structural changes of molecules during chemical reaction. 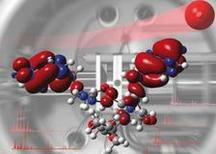 Precisely, we study the reacting molecules' time-dependent electronic and spatial behaviour. Beside developments in ultrafast optical spectroscopy, we continue to develop so-called "molecular movie methods" in the time-resolved and ultrafast X-ray field which include various types of ultrafast X-ray spectroscopy as well as high-resolution ultrafast X-ray diffraction and scattering techniques. In a chemical reaction, typical time scales of atomic or molecular motions start from femtoseconds, meaning the billionth of a millionth of a second. Life relevant motions, however, like moving a pen during writing, can be as slow as seconds or even down to minutes’ or hours’ time scales. How are these time scales connected? To what extend do structural motifs freeze in time and how is structural dynamics' information then distributed in space? Which type of apparatus needs to be built and which kind of methods need to be developed for investigating the created femtosecond “time stamps” in the structure of complex matter during the time course of a chemical or biochemical reaction? Investigating chemical reaction dynamics on the fundamental level, watching the making and breaking of chemical bonds in real time, or recording a “molecular movie” has been a longstanding dream in physical chemistry. Directly imaging the motion of single atoms in space and time is very challenging though, due to the molecular dimensions (~1Å) and the reaction time scales (~1-100fs). The advent of X-ray free-electron lasers that provide very short and very intense X-ray pulses has brought this dream a little closer to reality. Our research activities focus on investigating ultrafast molecular dynamics of gas-phase molecules, studied at accelerator-based lightsources. Molecular physics and photochemistry are omnipresent in everyday life: light-emitting diodes, photovoltaics, biosynthesis of vitamin D, UV-resistance of DNA, and many other processes are based on photochemical principles. However, some of the very fundamental reactions such as electrocyclic ring opening are not yet fully understood on the atomic level. If we can gain the necessary insight to understand, and eventually maybe even to control the outcome of such photochemical reactions, this would open the door to develop more efficient solar cells, to highly innovative medical applications, and many more. The investigation of such ultrafast processes in molecules with optical spectroscopy is referred to as femtochemistry, for which the Nobel Prize in chemistry was awarded to Ahmed Zewail in 1999. Directly imaging the motion of single atoms in space and time is very challenging though, due to the molecular dimensions and the reaction time scales. The typical bond distance between two atoms in a molecule is on the order of 1 Ångström (1 Å = 10-10 m) and rearrangement of atoms can happen on a time scale faster than 100 femtoseconds (1fs = 10-15 s). Our goal is to develop methods capable of imaging ultrafast processes on the atomic length and time scales in isolated molecules, in particular using ion momentum and electron spectroscopy following X-ray absorption. We approach this by starting with isolated atoms and then gradually turn towards larger molecules. Our main focus lies on time-resolved experiments employing electron and or ion momentum spectroscopy (figure right side). The advent of X-ray free-electron lasers such as FLASH and the European XFEL at DESY in Hamburg, the LCLS in California, and SACLA in Japan, brought forward unprecedented possibilities to study dynamical processes in the gas phase. The very short and very intense X-ray pulses made it possible, for the first time, to probe ultrafast photo-induced molecular dynamics following multiple, element-specific inner-shell absorption. Such X-ray pulses can remove many electrons from one specific atom in a larger molecule, thus generating a very high, localized charge. This charge can then spread to the molecular environment within a very short time. Charge transfer mechanisms play an important role in a variety of systems, and they lie at the heart of radiation damage processes that have been shown to occur in bioimaging experiments employing very intense X-ray radiation. Even in astrophysics, X-rays produced by charge transfer processes have been observed. In order to record a “movie” of the molecular dynamics, the same measurement has to be repeated many times, yielding different snapshots of the atomic motion; this is called a pump-probe experiment. 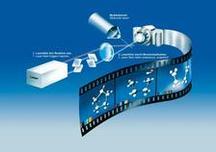 Through photoabsorption, it is possible to promote a molecule to a specific excited state. For example, the schematic potential energy curves (PECs) of fluoromethane (CH3F) and iodomethane (CH3I) illustrate that the different halogen species give rise to qualitatively different PECs. Absorption of one ultraviolet photon in CH3I leads to a repulsive neutral state, whereas multi-photon UV absorption in CH3F populates several higher-lying ionic states. After a tunable time delay, an intense X-ray pulse probes the dissociating system by ionizing predominantly the iodine (3d) or the fluorine (1s) level, respectively, because of their large absorption cross sections, resulting in a localized positive charge on the halogen. If the halogen atom is already ionized, the high charge stays on this atom and the rest of the molecule remains neutral. As long as the two fragments are close to each other, the charge can spread over to the other atoms. It is this transition from a bound molecule to isolated atoms that we probe by time-resolved ion spectroscopy. The recorded ions can be used to extract the critical internuclear distance, up to which electron transfer from methyl to iodine is possible. We have observed signatures of long-distance intramolecular electron transfer (up to 15 Å for I21+), which is, among others, highly relevant for radiation damage in imaging experiments involving heavy atomic species. Electrospray ionization (ESI) is a gentle, state-of-the-art technique to introduce biomolecular ions from solution into the gas phase and into vacuum, providing a solvent- and substrate-free environment. This allows studying the molecule in a well-defined, isolated state, where only intramolecular interactions have to be considered for describing structure and dynamics. The combination of an ESI source with advanced light sources such as synchrotrons, free-electron lasers and high harmonic generation sources allows for a novel and unique way to investigate structure and dynamics of gas-phase biomolecules. In particular, synchrotron and free-electron laser sources have the great advantage of superior photon brilliance, a wide photon energy range as well as polarization tunability. This enables systematic studies of energy and polarization dependent effects of ionization and dissociation processes. (i) Circular dichroism: Homochiral molecules have different absorption efficiencies for right or left circularly polarized light, the so-called circular dichroism (CD). Many CD studies aimed at discovering structural information on amino acids, proteins and DNA (building blocks) have been performed in the ultra-violet (UV) spectral region, but only a few CD studies enter the X-ray spectral range, where despite a very localized excitation, strong CD was observed. This local, site-selective probing with an X-ray pulse does not average the signal over the whole molecule, as is the case in the UV-visible absorption, and hence is a more selective tool to investigate structure-dependent dynamics in the molecule. (ii) Radiation damage: Radiation therapy relies on ionizing radiation, yet, there is no consistent knowledge of the exact cascade of processes leading to radiation damage in a cell on atomic length and time scales. It is important to understand the details in the mechanisms of radiosensitizers, to increase the impact on tumors and to find non-toxic alternatives. 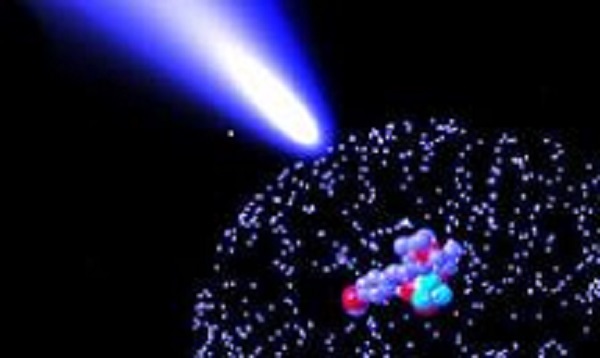 To study the ultrafast processes of radiation damage on the molecular level, photoionization and photodissociation experiments are performed on gas-phase nucleobases, amino acids, oligonucleotides and peptides. These molecules will be explored in the pure as well as nanosolvated form. Moreover, metal ligands as well as radiosensitizers like cisplatin attached to oligonucleotides will be studied. (iii) Ultrafast charge migration: Ultrafast charge transfer is believed to play an important role in biological energy conversion processes, such as light harvesting processes in plants. Pump-probe experiments of peptides will be performed to understand the fast charge migration processes in detail in terms of size, structure and time. As in optical laser sciences, X-ray laser science allows to couple X-ray techniques coming from entirely complementary pools of methods. Such a merge resembles the “local to global” approach when combining ultrafast X-ray diffraction (with precisions down to electron density determination) with highest energy resolution X-ray spectroscopy. Both methods are technically demanding by their own: ultraprecise structure determination requires the use of very hard X-ray radiation (starting from 18 keV X-ray energy) and very high angular momentum collection, on one hand; on the other hand, X-ray spectroscopy with ultra-high energy resolution requires highest spectrometer grating resolution (down to 0.000001 keV resolution on a scale of 5.000000 keV X-ray energy) or the implementation of two-dimensional X-ray laser spectroscopy techniques, and all of that on the ultrafast time scale (and combined). In order to reach the desired chemically meaningful temporal resolution, the optical laser pump initiates the reaction and the X-ray laser pulse probes the ultrafast proceeding chemical reaction by collecting the X-ray spectroscopic signal and/or the X-ray diffraction signal in common photon in / photon out type of approach. In the first time of experiment the photographic camera is a detector which collects the X-ray diffraction signal, in the 2nd type of experiment a second camera is attached which collect the energy resolved X-ray spectroscopic signal in emission. An example of a two-dimensional X-ray spectroscopy study of simple water following such an experimental approach [3,4] is shown on the top of the introduction figure. 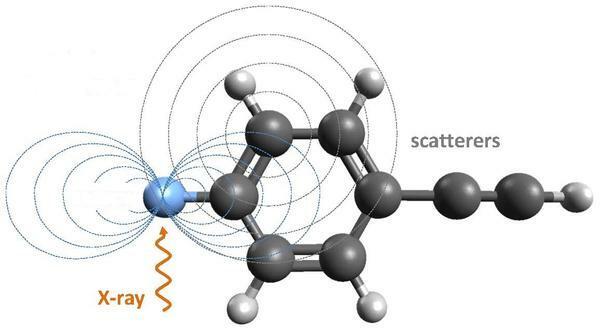 On the bottom left, the migration of electrons is shown through a wire type of organic molecules, as been determined by ultrafast x-ray diffraction and after ultrafast optical excitation. The methods can be utilized for reaction in all thermodynamic phases (gaseous, liquid and solid). Applied methods include photo electron diffraction or Coulomb explosion schemes , ultrafast two-dimensional X-ray spectroscopy , ultrafast X-ray emission spectroscopy and X-ray scattering schemes [7,8] or ultrafast diffraction . Proceeding laboratory based methods, free electron laser radiation makes it possible not only to study unimolecular reactions, which is the classical theme of ultrafast chemical research, but also to investigate bimolecular reaction in the liquid phase which are the more common type of reactions in nature. As a consequence of the technical developments summarized, and based on the chemical time laws derived during the various method development steps, as a side result it has become possible to optimize functional performances i.e. of organic materials or devices with solar cell activities (figure right side). By moving the fundamental methods developments into the application regime (again as a proof for the methods’ developments), the circle of promises closes that 3rd and 4th generation X-ray sources may help to optimize strategies for modern material performances. Since the time-resolved X-ray spectroscopy and X-ray diffraction experiments allow for detangling local to and local from global structural responses, desired functional actions of a device like energy storage can be distinguished from “energy-eating” processes based on non-desired heating and energy quenching processes. In the right-side figure the performance of an optimized all-over organic solar cell is presented. Small atomic (even not molecular) changes on the light-absorbing chromophore unit lead to a complete switch of its functional dynamics – from light absorbing solar cell devices [11-13] to a light emitting organic diode . In another example the understanding of the crystallization processes of organic material out of TRXRD studies has been influenced by the optimization of the recycling process of molten PET bottles to ultra-hard polyethylene . Such ultra-hard plastic material is currently built in every 2nd wind craft machine produced. Other applications may include the study of complex energy transforming steps in complex macromolecules . One example of a merge of complementary techniques is the combination of high flux and high energy resolution X-ray spectroscopy with electro spray ionization and mass spectrometry. The right-side figure summarizes other method compositions of synchrotron and free electron laser X-ray scattering and structure determination methods with reaction initiating or thermodynamically and kinetically modulating techniques which can be distinguished as physical modulation techniques or chemical modulation techniques . As in the right-side figure, the presented examples are various types of macromolecules. Depending on the time scale to be studied in real time it is possible to merge X-ray scattering techniques like diffuse X-ray scattering with pressure jump, electric field modulations, temperature jump – or – on the chemical modulation site with structural freezing methods, rapid mixing or photo switching methods . S. Techert, F. Schotte, M. Wulff, Picosecond x-ray diffraction probed transient structural changes in organic solids, Phys. Rev. Lett. 86, 2030-2034 (2001). S. Bari, R. Boll, S. E. Canton, L. Glaser, K. Idzik, K. Kubicek, D. Raiser, S. Thekku Veedu, Z. Yin, S. Techert, High flux X-ray sources and Free Electron Lasers for studying ultrafast time structure imprints in complex chemical and biochemical reactions, in: X-ray Free Electron Lasers, eds. U. Bergmann, P. Pellegrini, Oxford University Press, in press (2016) and references therein. Z. Yin et al., Probing the Hofmeister effect with ultra-fast core-hole spectroscopy, J. Phys. Chem. B 118 (31), 9398-9403 (2014). S. Schreck et al. Reabsorption of soft x-ray emission at high x-ray free-electron laser fluences, Phys. Rev. Lett. 113 (15), 153002 (2014). R. Boll et al., Imaging molecular structure through femtosecond photoelectron diffraction on spatially aligned and oriented gas-phase molecules, Faraday Discuss. 171, 1–24 (2014). P. Wernet et al., Orbital-specific mapping of the ligand exchange dynamics of Fe(CO)5 in solution, Nature 520 (7545), 78-81 (2015). W. Zhang et al., K. Kubicek et al., Tracking excited state charge and spin dynamics in iron coordination complexes, Nature 509 (7500), 345-8 (2014). S. E. Canton et al., Visualizing the non-equilibrium dynamics of photoinduced intramolecular electron transfer with femtosecond X-ray pulses, Nat. Comm. 6 (3), 6359-6362 (2015). I. Rajkovic et al., Diffraction properties of periodic lattices under free electron laser radiation, Phys. Rev. Lett. 104, 125503-6 (2010). From Structural to Functional Dynamics. S. Thekku Veedu et al., Ultrafast dynamical study of pyrene-N,N-dimethylaniline as an organic molecular diode in solid state, J. Phys. Chem. B 118 (12), 3291 - 3297 (2014). S. Mildner et al., Temperature and doping dependent optical absorption in the small polaron system Pr1-xCaxMnO3, Phys. Rev. B 92 (3), 35145-35148 (2015). D. Raiser et al., Evolution of hot polaron states with ns lifetime in a manganite, submitted (2016). K. R. Idzik et al., The optical properties and quantum chemical calculations of thienyl and furyl derivatives of pyrene, Phys. Chem. Chem. Phys., 17 (35), 22758-22769 (2015). M. Petri, private communication (2016) and http://www.armacell-core foams.com/www/armacell/INETArmacell.nsf/standard/ DC2C5D13EA92BD46802576E200526C26. C. Kupitz et al., S. Bari et al., Serial time-resolved crystallography of photosystem II using a femtosecond X-ray laser, Nature 513 (7417), 261-265 (2014). From Structural to Topological Dynamics. E. Ferrari et al., L. Glaser et al., Single shot polarization characterization of XUV FEL pulses from crossed polarized undulators, Nat. Sci Rep. 5, 13531-4 (2015). Z. Yin et al., Experimental setup for high resolution X-ray spectroscopy of solids and liquid samples, Proc. SPIE 8849, X-Ray Lasers and Coherent X-Ray Sources: Development and Applications X, 88490I (2013). J. Schulz, S. Bari et al., Sample refreshment schemes for high repetition rate FEL experiments, Proc. SPIE 8778, Advances in X-Ray Free Electron Lasers II: Instrumentation, 87780T (2013). O. González-Magaña et al., S. Bari et al., Fragmentation of protonated oligonucleotides by energetic photons and Cq+ ions, Phys. Rev. A 87 (3), 032702-12 (2013). S. MacLot et al., S. Bari et al., Ion-induced fragmentation of amino acids: effect of the environment, Chem. Phys. Chem. 12 (5), 930-936 (2011). 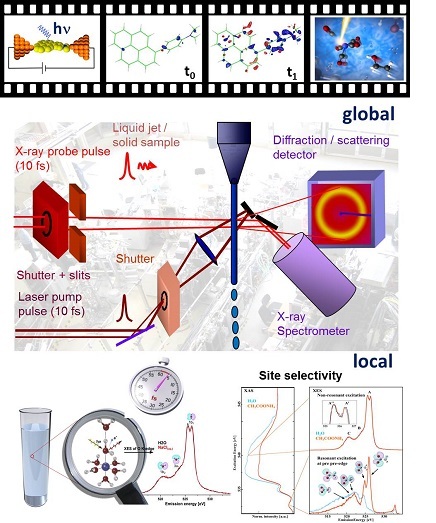 R. Jain, S. Techert, Time-resolved and in-situ X-ray scattering methods beyond photoactivation: utilizing high-flux X-ray sources for the study of ubiquitious non-photon active proteins, Special Issue: “Synchrotron Applications in Life Sciences”, Prot. Pept. Lett. 23 (999), 01-08 (2016) and references therein. Considering the group’s name, one may believe that the FS-SCS group consists of chemists only. But this is not the case. Our group members are not only chemists, but also physicists and biologists. Therefore, our group’s name shouldrather be Structural Dynamics in Biophysical Chemistry. Currently, we even have more physicists than any other scientists. Personally, we really like this fact because due to these different scientific fields within our group, we never stay focused on one particular research area. This fact makes an inspiring, stimulating and creative exchange of ideas possible, often leading to great new scientific findings. How does this scientific diversity work? Within the field of physics, we develop instrumentation for high flux X-ray sources which are necessary for further research, precisely for the investigation of structural dynamics of complex chemical systems which then, eventually, may lead to an optimization of functional dynamics in not only chemical but also biological systems. So for example, the X-ray spectroscopy of molecular switches makes it possible to measure the molecules’ change of structure as a function of time, leading to an optimization of their structure for fast time response = 0 and therefore, generating new possibilities in the field of optical switches.